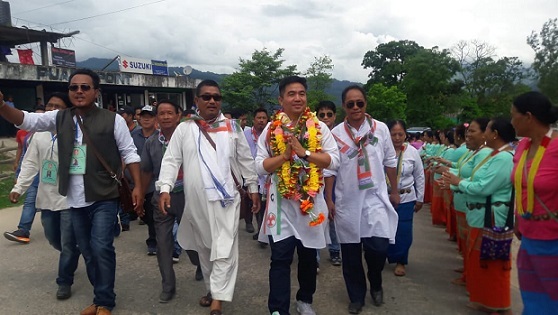 Geli Ete on Tuesday took out a rally here during his maiden tour to West Siang district after being appointed as the president of the Arunachal Pradesh Youth Congress (APYC). More than 2,000 people gathered at the Aalo Congress Bhavan for the rally. Ete exhorted the youth to come forward in mainstream politics and serve the State. He emphasised on stopping drug abuse that is on the rise in West Siang district and asked the police to keep strict vigil against the drug-peddlers. He later led an APYC team to the general hospital, which was found to be in very poor state with even the newly-constructed blood bank building not being up to the mark. He appealed to the district health officials to improve the infrastructure and keep the hospital as per standard of general hospital and urged the Health department to install MRI, start ultrasound service, ensure uninterrupted electricity at the hospital with generator and provide child and ENT specialists. The APYC team however could not meet the West Siang DMO. Ete on Wednesday also visited Paya village in West Siang where the PWD has failed to build a bridge that was sanctioned during the Congress rule. The villagers have been suffering because of poor connectivity. The APYC president said the organisation would soon rally against the PWD and Health Departments for neglecting the welfare of Aalo, Paya and West Siang district.